I’ve never really followed baseball all that much. I’ve obviously been more of a cricket fan – let’s face it, I live in Australia where cricket is on at the right time of day and gets considerable coverage, whereas baseball is on early mornings in Australia, and really only gets a mention when an Aussie plays, or the World Series is on. As part of our trip to the USA I was keen on seeing a match of “America’s favourite game”, and given that there are thousands of matches each season I had hoped this would be an easy task. As was the case with the ice hockey, I had made the decision that I would adopt as “my team” the first team that I was able to see live. I have always been a nominal Boston Red Sox fan, because they wore red and blue, same as my AFL team. There was a chance we may have been able to go to a Red Sox v White Sox game while in Chicago – meaning I could convert my support from “oh look they won the World Series”, to actually seeing how they went during the season, but other commitments got in the way. We also looked at Yankees tickets on the night of our arrival in New York, but this would have required a second mortgage. 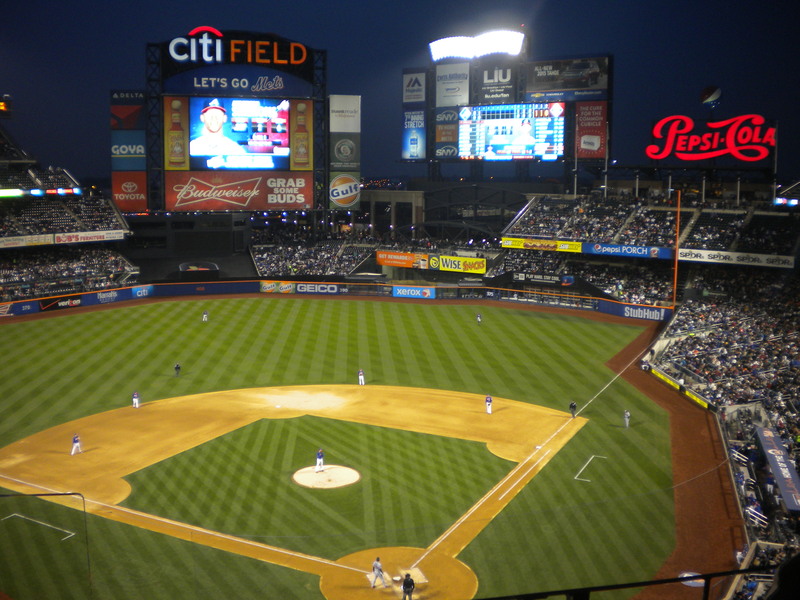 An easy and accessible option was to head along to Citi Field in Queens, New York, to watch the New York Mets play. 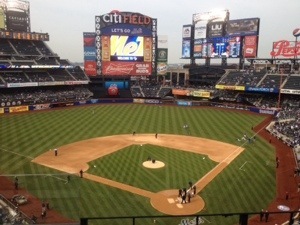 There were two games on while we were in New York, on 18 and 19 April. I chose to go to the game on the night of the 18th, which, due to time differences, would be when friends and family in Australia were waking up on my 35th birthday. On our trip so far, we had been to the snow at Whistler, Canada, which was warm and sunny, and been to Chicago, where it snowed. Neither of these places were as cold as New York that night, despite the fact that it didn’t snow. While I normally would have preferred to pick up some merchandise after the game, I was determined to search for a Mets beanie pre-game for practical purposes. On arrival at Citi Field, I was pretty impressed with the facilities, as it is a new stadium built to replace the Mets old home, Shea Stadium. 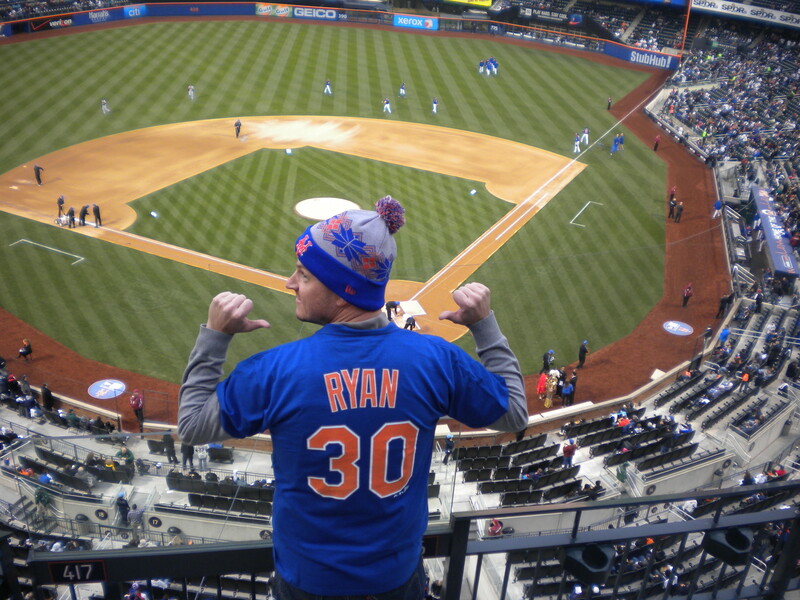 It was “Free T-Shirt Friday”, so everyone was given an extra large New York Mets tee. Kids were wearing them around like dresses. There was a giant team store on the lower level, but it was sold out of beanies. We went upstairs to the second level, where there was another big store, also sold out of beanies. I asked people wearing beanies where they had got theirs from, but most had received them from friends or bought them from elsewhere. Finally, we got to the top level, where tucked away in the corner there was a small supply. I would be able to keep warm that night! The other thing I noticed were the player t-shirts. 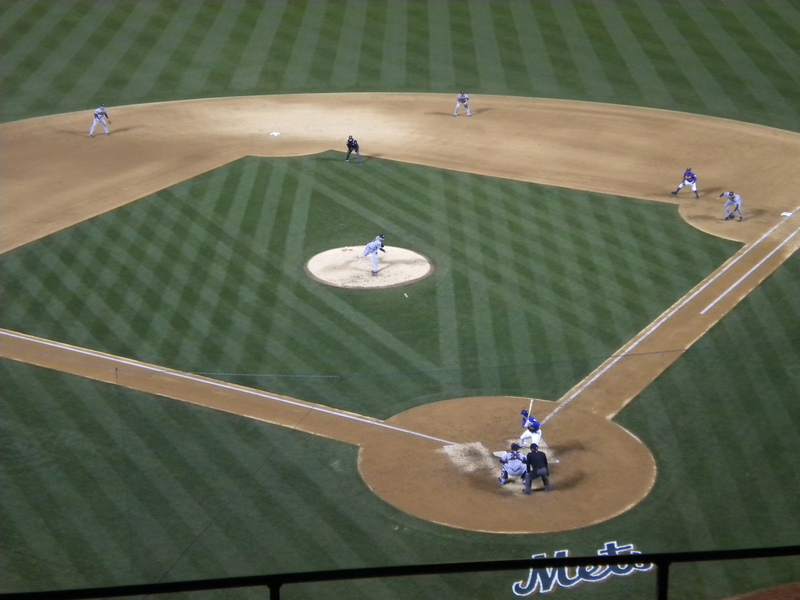 I had done a bit of research and knew some of the key players – Wright, Granderson, and Young Jr. There were proper playing shirts with their names and numbers, as well as cheaper t-shirts. I also found those same t-shirts with names and numbers of club legends such as Darryl Strawberry. Being a Simpsons fan, Geri thought it would be funny if I bought one of those. 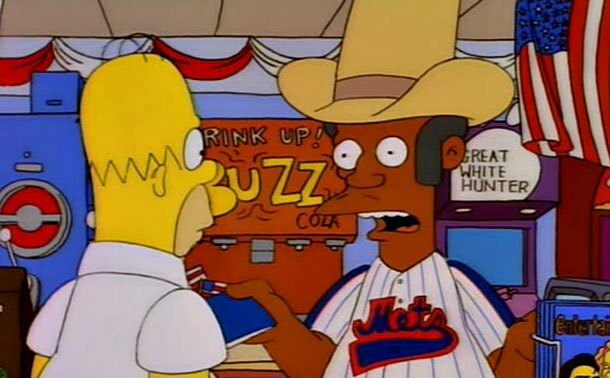 I thought it would be funnier if there was an Apu Nahasaheemapetilon Mets shirt. Then I found one with “Ryan” on it, and number 30. There was a player with my last name playing for them? I had to get this shirt! I’ve been warned that American beer is crap. I forgot to mention in my Masters blog that we tried a Coors. It was as the warnings predicted. But, at the Baseball, and at most bars and even sporting events, there are boutique or craft beer options to try. We thoroughly enjoyed the IPAs available on tap. We bought a beer each and then walked out to our seats on the fourth level. If I thought New York was cold, it was about to get worse. 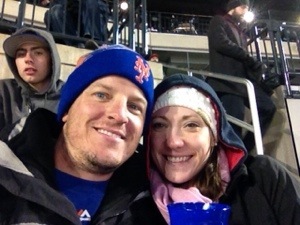 With the swirling winds of the stadium blowing around icy cold air, we were glad we had brought ski jackets and gloves! Anyway, back to Mr Ryan. The scoreboards were huge and informative. I looked at the board to see if Ryan was playing, but his name wasn’t listed. So, using the free, and fast, wifi available in the stadium, I googled his name. Turns out I had bought a legend’s shirt. Nolan Ryan was a great pitcher for the Mets in their World Series winning team of 1969. Even though I wouldn’t be seeing a Ryan play tonight, I was still very happy with my purchase! Speaking of wifi, how good is it to have free and fast wifi at a sports stadium? I was able to look up stats during the game, and more importantly, receive messages from friends and family back home to say happy birthday! 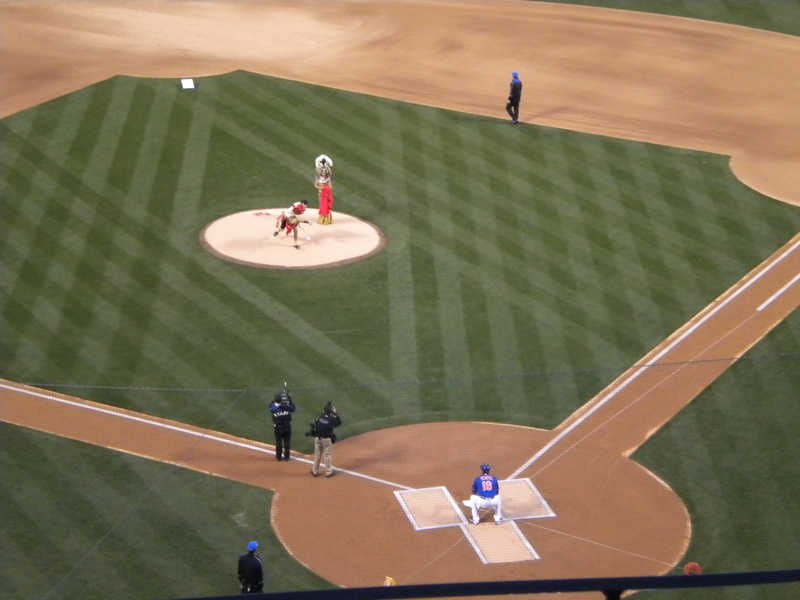 Tonight’s game was sponsored by Caesars Palace Atlantic City – so the ceremonial first pitch was thrown by “Caesar”, who was accompanied by “Cleopatra”. Watching the game live in the stadium taught me a few things I didn’t really know about baseball. Because I had never really sat and watched a full game on TV, I’d assumed that team batting orders reset at each innings, just like cricket. This isn’t the case. I’d never understood what pinch hitters do – and now I’ve seen them in action replacing the pitcher when it is his turn to bat. I enjoyed watching the changes in strategy when there’s a runner on base – the pitcher was always looking over his shoulder, the base fielders stood in different places, and the mindset of the game seemed to change. Also, I’d never understood pitching rotations – boy did we get a lesson in that during this game – because this was clearly an off night for the Mets. Initially their pitcher barely managed a strike, with each out coming from a catch. Atlanta scored early from an error. In contrast, Braves pitcher Aaron Harang had a “no-hitter”. Changes to the Mets pitching rotation seemed to help with keeping Atlanta off the bases, but then, Freeman, in the 8th inning, with two runners on base, smacked one that just seemed to hang in the air for ages, clearing the right field fence. The atmosphere was much like soccer – when it is low scoring you have nothing to cheer about, and the tension builds until it is released. When you only have one hit to cheer, it is a bit of a release. David Wright managed that sole hit in the 8th inning and the crowd let out a groan. As if to say, “finally”! By this stage up in the 4th level we were one of the few that stayed. 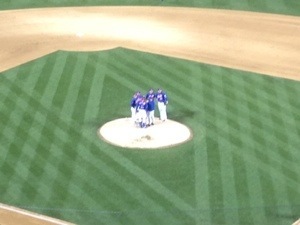 Entering the 9th inning 6 runs down and with 3 of your last four batters to come, there was little hope of a miracle. The game petered out to a muted conclusion. Despite the result, it was still a very entertaining night. As was the case with hockey, watching live has given me a far better understanding of what is going on and the skills required to play the game. Having been forced to sit in the cold all night, watching a game that she didn’t find very interesting, Geri told me at the end of the game she would start following the Yankees. This could be the start of another great in-house rivalry. This entry was posted in Baseball and tagged atlanta braves, baseball, citi field, david wright, major league baseball, mlb, new york mets, nolan ryan. Bookmark the permalink.